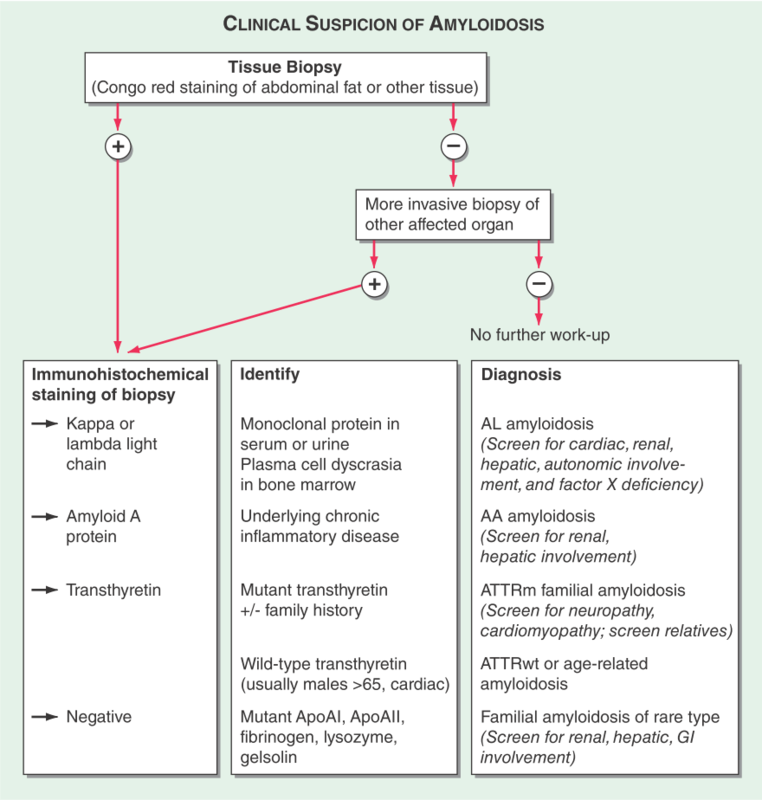 Amyloidosis is a general term for a group of protein disorders related to protein misfolding with extracellular deposition of insoluble polymeric protein fibrils in tissues and organs. A cellular machinery exists to take care of protein folding during the process of synthesis and secretion, to ensure that they achieve the right tertiary conformation and function, and to eliminate proteins that are misfolded. However, genetic mutation, incorrect processing, and other factors may favor misfolding, with consequent loss of normal protein function and intracellular or extracellular aggregation. Peripheral neuropathy (disease of one or more peripheral nerves, causing numbness or weakness)is a common and often the most prominent manifestation of amyloidosis. The polyneuropathies are of two main types-those associated with familial amyloidosis (referred to as FA) and the other associated with primary (nonfamilial) systemic deposition of amyloid (termed AL), which is derived from a circulating monoclonal (derived from identical cells that are all clones of a unique parent cell)protein. The pattern of inheritance in all types is autosomal dominant; males and females are affected equally. Although a descriptive classification based on the ethnic or geographic origin of affected families is still in use, it is now possible to categorize the diseases according to their genetic causes and the corresponding chemical structure of the amyloid protein that is deposited in tissue. The Portuguese (Andrade) type. It was recognized by Andrade in 1939 as a chronic familial illness known as “foot disease” among the inhabitants of Oporto, Portugal. The age of onset is between 25 and 35 years. The disease progresses slowly and terminates fatally in 10 to 15 or more years. The symptoms usually are : autonomic involvement ,difficulty in walking ,numbness, paresthesias (abnormal sensation, typically tingling or pricking), and sometimes pain in the feet and lower legs. Weakness is minimal, and the tendon reflexes, although diminished, may be retained early in the course of the illness. Cranial nerve involvement (facial weakness and numbness, loss of taste) is a late manifestation and occurs in only a few cases. Liver and cardiac enlargement and irregularities in cardiac rhythm as a result of bundle-branch or atrioventricular (AV) block occur early in some and late in others. Familial amyloidosis with carpal tunnel syndrome (Swiss type). Described in 1955 in a large group of patients of Swiss stock living in Indiana who developed, a syndrome of acroparesthesias ( burning, tingling sensations or numbness in the extremities of unknown cause or produced by compression of nerves during sleep)in the hands as a result of deposition of amyloid in the connective tissues and beneath the carpal ligaments in their fourth and fifth decades. As with the Portuguese type, an abnormal transthyretin is the basis of the deposition of amyloid. Iowa type. In 1969, van Allen described an Iowa kindred with onset, in their thirties, of a fairly severe sensorimotor neuropathy, involving the legs and then the arms. There was amyloid deposition in the testes, adrenal glands, and kidneys (the usual cause of death), as well as a high incidence of peptic ulcer disease. The amyloid in this disease is derived from a mutated apolipoprotein A1 (a protein important in transportation and metabolism of lipids and the main protein component in high-density lipoprotein-HDL, the “good cholesterol”),in which there is an amino acid substitution. Cranial neuropathywith corneal lattice dystrophy and facial palsies. Described in three Finnish families by Meretoja, hence the label “Finish type.”. The disease usually begins in the third decade with lattice corneal dystrophy. Vitreous opacities are not observed, and visual acuity is little affected. Peripheral neuropathy may not be evident until the fifth decade, at which time the facial nerves, particularly their upper branches, become affected. The nerves of the limbs are involved even later and to a much lesser extent than in other amyloid neuropathies. In advanced cases there is a distinctive appearance of excessive skin folds about the face, facial diparesis (weakness affecting symmetrically opposed parts of the body), dysarthria (difficulty in articulating words), spasticity( a condition with continuousmuscle contraction), and dense loss of posterior column (nerve tracts in the white matter of the spinal cord)function. Johns Hopkins physicians report success in a small study of a modified skin biopsy for early diagnosis of transthyretin amyloidosis which seems to offer a clearer view of the disorder’s severity and progression. With a quicker and less invasive way (traditionally, a firm diagnosis of the disorder requires a surgical nerve biopsy followed by genetic tests) to visualize the hallmark protein clumps , the physicians say they hope to more rapidly advance clinical trials of treatments that may slow the disease and extend patients’ lives. The new study was designed to see if a faster and better diagnosis could be made for transthyretin amyloidosis using a modified version of the skin biopsy technique. For the study, 30 patients were recruited with six different genetically-confirmed transthyretin amyloidosis mutations. Twenty patients had neuropathy symptoms and 10 did not. They also recruited 20 age and gender-matched healthy controls, and 20 age and gender-matched patients with diabetic neuropathy (a different form of peripheral nerve damage due to high blood sugar). Each subject had skin biopsies taken from their outer ankle and upper thigh. 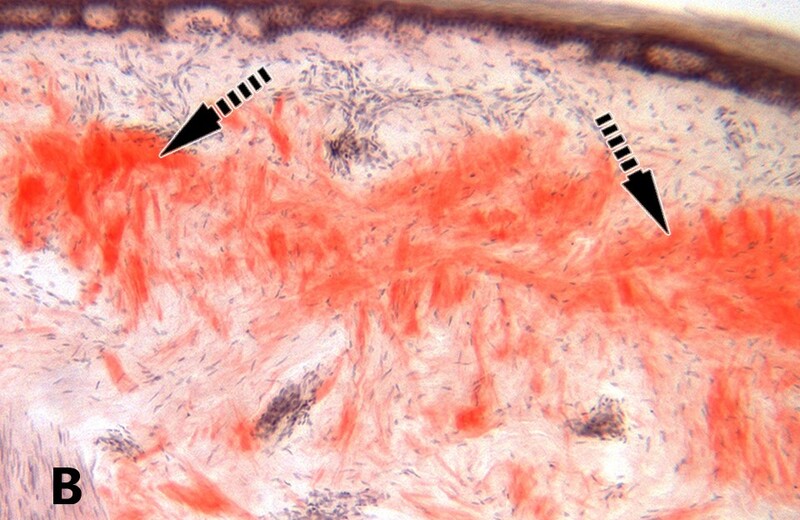 The biopsies were thinly sliced and stained with a dye called Congo red that allowed the researchers to view the protein clumps in the layers of skin or within the sweat glands and pilomotor muscles (those that cause goose bumps) under the microscope. Researchers observed the protein clumps in 14 people with symptoms of neuropathy and the disease and in two people with the disease but without accompanying neuropathy symptoms. The protein clumps weren’t seen in any of the healthy controls or in samples from people with diabetic neuropathy. The disability level aligned with the quantity of amyloid (protein clumps) present makes intuitive sense, but what really amazed the physicians was that the information from a small skin biopsy would correlate so well with disease severity suggesting that what is found in the skin reflects what the disease is doing in the rest of the body. Researchers believe that in the future if this method is further confirmed it may be used as a biomarker for disease severity resulting in the ability to diagnose more patients sooner, which is important for patients and their families so they can begin planning for the future. The good news is that drug companies are using the skin biopsy technique in ongoing clinical trials to monitor treatment success. The study was funded by a grant from Pfizer, Inc., and Michael Polydefkis, professor of neurology at the Johns Hopkins University School of Medicine and senior author on the study is working with Alnylam Pharmaceuticals to test new therapies for patients with transthyretin amyloidosis.